​We are proud to have Camp Bow Wow Summerlin as one of our sponsors helping us provide temporary boarding for our foster pups. Desert Diva Dogs collects and donates pet supplies to animal rescues and provides pet-related information and resources to community organizations to help pets in need. ​PALS is a local pet food bank that supports rescues and provides them with free/low cost pet food and supplies. If you shop at Smith's Grocery Store, a portion of your purchase can be donated to our rescue. Follow the link Donate and sign into your account and choose Vegas Pet Rescue Project as your designated charity. ​You get 20% OFF at 1-800-PetMeds, and we get a $20 Donation! ​Shop now! Use our unique link and you will get a discount on your first box, PLUS BarkBox will generously donate $25 to VPRP! ​Book a service with Rover using our special link and Vegas Pet Rescue Project will receive a $30 donation. Click here to get started. 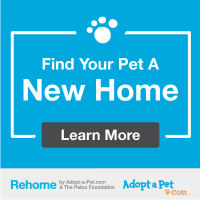 If for any reason we are unable to help you rehome your pet, Rehome by Adopt-a-Pet.com & The Petco Foundation is a simple, reliable, and free program with great resources and tools to help you place your pet from your loving home directly to another. Click here to get started.